THE QUILTED PINEAPPLE: Trying Blog Press and Market Quilt Sneak Peek! Ok so I am trying out the Blog Press App for my phone. The Blogger App is 2 big thumbs down!!! So hopefully this will be a better option. The post did great---keep the pictures coming! You did a fab-u-lous job quilting Lisa's quilts. I'm making another comment. Would love to see lots of pictures of the "prim" booth as it seems everyone else posts the modern ones. Thanks. The post looks fine. 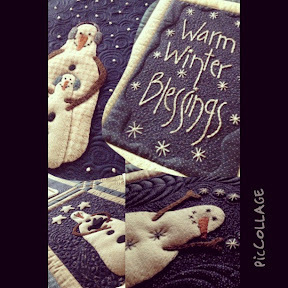 Even the collage pictures of LB's quilts. Like Marie said lots o' pictures of the booth please. We want to know what your doing and what the hot seller is. Have fun! So far so good, Linda! I'm glad it's working for you! Those are some adorable quilts and your quilting looks great too! It worked great for me! Love pictures, the quilting as always is stunning! More, more, more please! And I so agree with Marie, not really interested in seeing the modern booths, lots of primitive makes me happy! Looks good, now we can enjoy the market through your blog! Yeah! Amazing quilting, love the look. Looking forward to seeing more from Houston. Oh, please show more. I bet these quilts are spectacular! And I love snowmen. And please give us a full report on Blog Press, once you've had enough time to assess it fully. I'd like to blog from my iPad. I saw her quilts on the post and love the quilting and love the quilts, maybe something to make for next year. They look great! I'm so excited for you to be in Houston. Hope you are having a blast! Looks wonderful! Have a blast at Market! Your quilting is spectacular! Keep the Houston posts coming with lots of pics! Absolutely beautiful feathers!! Yes please, more pics! Post looks great. Would love a full opinion of the app once you play around a little more! Great post with blogpress. Take lots of pictures for us. 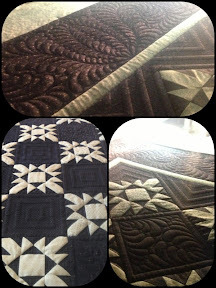 Your quilting on Lisa's designs is stunning! Have tons of fun there. Over the top beautiful quilting!! So inspiring.... Please post more pics if you can find the time. Your quilting is magnificent - hope you're enjoying (have enjoyed?) market!